What is the Island Design Assembly? 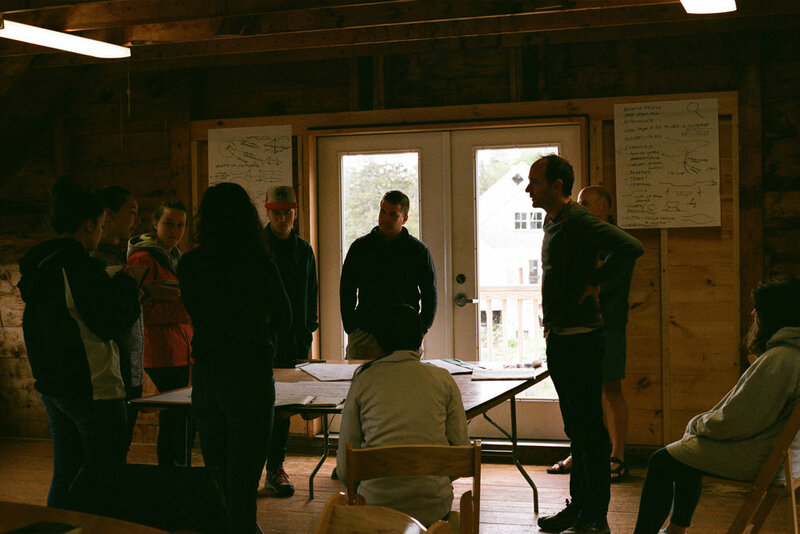 The IDA is a 9-day intensive design build education program led by licensed architects and builders for the education of architecture students and advancement of Penobscot Bay, Maine. The Lily Guest Footbridge was brought from conception to reality between June 2nd and 10th, 2017. 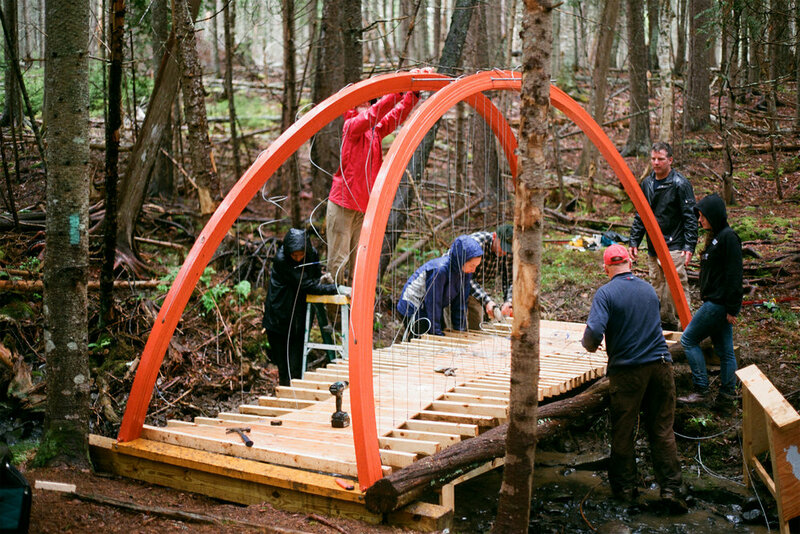 The design process for the Lily Guest Memorial Trail Footbridge took place from Friday evening to Sunday evening, so that material orders could be placed to the mainland first thing Monday morning. As an off-grid island, Hurricane has some infrastructural independence, but food and building supplies need to be continually restocked via boat delivery from mainland coastal Maine. The idea to create a moment of elevation within the trail procession, within which a visitor steps above the igneous ground, and is drawn upwards towards the distant coniferous canopy was reached during the design process. Towards this objective, the decision was reached to create a bridge of a suspended walking platform strung from two elliptical arches. 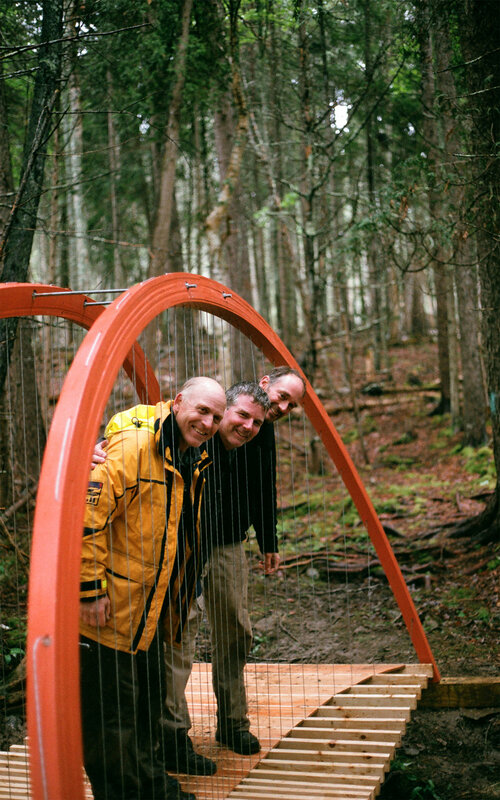 The arches were created from laminated timber pieces, glued and dried within an articulated elliptical formwork. 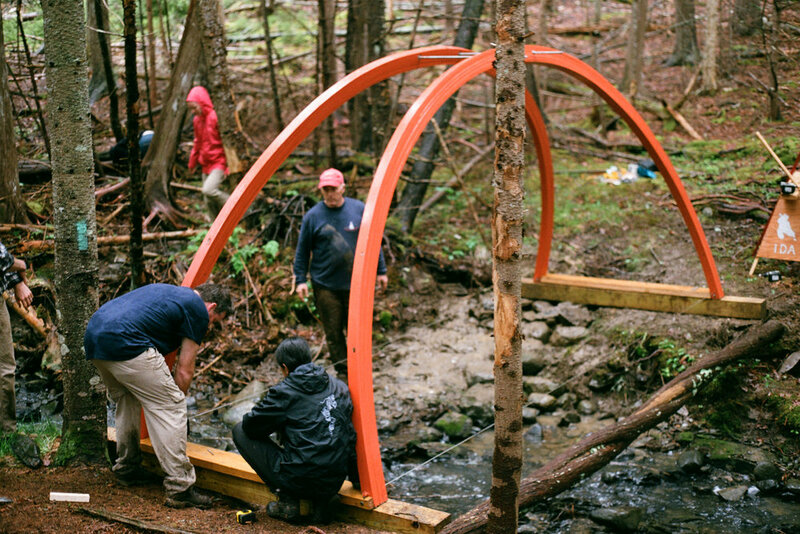 The footbridge was fully constructed and tested in full within the garage on Hurricane Island prior to transport in order to ensure its strength, balance, and spatial experience. After testing, the bridge was disassembled in full, broken down into its constituent parts, and loaded onto the rented passenger boat, the Equinox for transport from Hurricane to Islesboro Island. 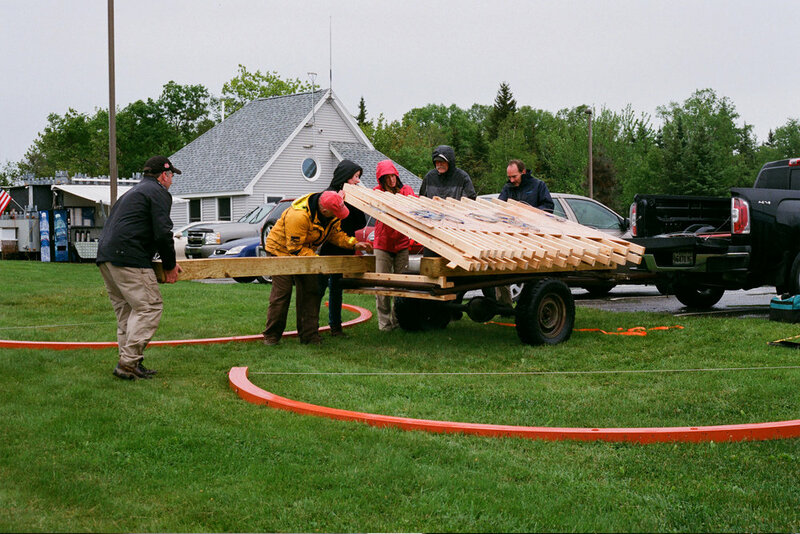 Once at Islesboro, it was unloaded from the Equinox, and loaded into a pickup truck for transport from port to the Lily Guest Memorial Trail. 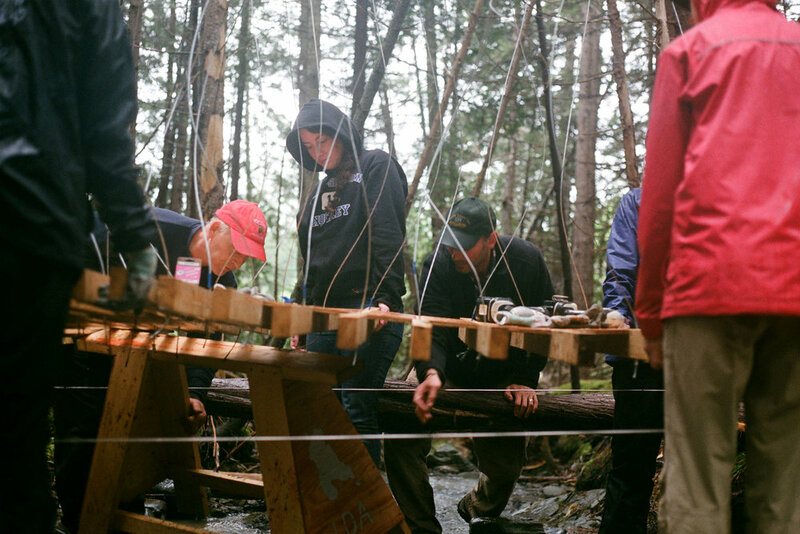 The pieces were then carried approximately one half mile through dense coniferous forest and swampland to the site, a stream crossing with a 16' span bank to bank. Once on site, foundations were secured by sinking 6x6 bases into the mud, and securing them with 4' rebar piles. The arches were secured to the foundations with custom dadoed microlam joints. The walking surface attached to the arches with 3/8" dia. threaded steel cable strung through copper-fitted joints. Each floor joist was independently secured for maximum distribution of weight. The entire transport and build process took place during June 10th, and lasted approximately 14 hours. All the staff of Hurricane Island Foundation for their kindness, hospitality, and loving generosity. Leaders and architects John McLeod and Steve Kredell, and to master builder Alex Carver, nothing could have been accomplished without your efforts. Team members: Nadia Bednarczuk, Molly Evans, Ali Horwitz, Will Lones, Ami Mehta, Lauren Mitchell, and Edith Gawler for being wonderful friends and partners in building. To Steve Miller and the Islesboro Land Trust for being such incredibly trusting and kind clients.